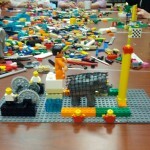 I am so exited with my LEGO SERIOUS PLAY facilitator training and I decided to do 2 posts. One with one introduction to the method and a second one with my experience in the training. Let’s do the introduction here. LEGO SERIOUS PLAY (LSP) is a facilitated meeting, communication and problem-solving method, where participants are led through a series, which go deeper and deeper. Each participant builds his or her own three-dimensional LEGO model in response to the facilitator’s questions using specially selected LEGO bricks. These 3D models serve as the basis for group discussion, knowledge sharing, problem-solving and decision-making. With LEGO SERIOUS PLAY approach the result are “lean forward meetings”. This means more participation, more insights, more knowledge, more engagement and, ultimately, more commitment and faster implementation. It was a really pleasure experience for me to get along with you while the LEGO Serious Play T3 course. Let’s make it FUN HARD! It was a pleasure for me also. I really enjoyed it and got a lot of hard fun. Keep in touch!! !